Predator. Prey to the heavens [electronic resource] / script, John Arcudi ; pencils, Javier Saltares ; inks, Javier Saltares with Walden Wong and Bucky Gomez ; colors, Wes Dzioba and Andrew Elder ; lettering, Blambot!. [United States] : Dark Horse : Made available through hoopla, 2012. The world's attention is focused painfully on a brutal third-world civil war, a merciless sectarian conflict sparing neither soldier nor civilian, grandmother nor child. But amidst the terror and carnage, where great nations and powerful interests jockey for position and advantage, another blood feud rages in the shadows, one no more humane but decidedly less human. Two warring tribes from the stars have chosen Earth's killing fields as their arena, with each clan sworn to eradicate the other... and all who stand between them. Each is the other's prey, each the other's Predator. 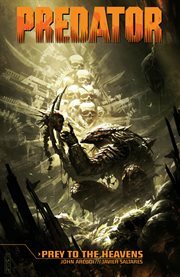 The hunt resumes as Dark Horse Books unleashes Predator once again into the graphic-fiction jungle. Features the creative team of writer John Arcudi (Aliens, B.P.R.D., Doom Patrol) and artist Javier Saltares (Aliens vs. Predator, Ghost Rider).